Ara constellation, the Altar, is a southern constellation sitting below the tail of the Scorpion, constellation Scorpio, between constellation Lupus and constellation Cygnus. 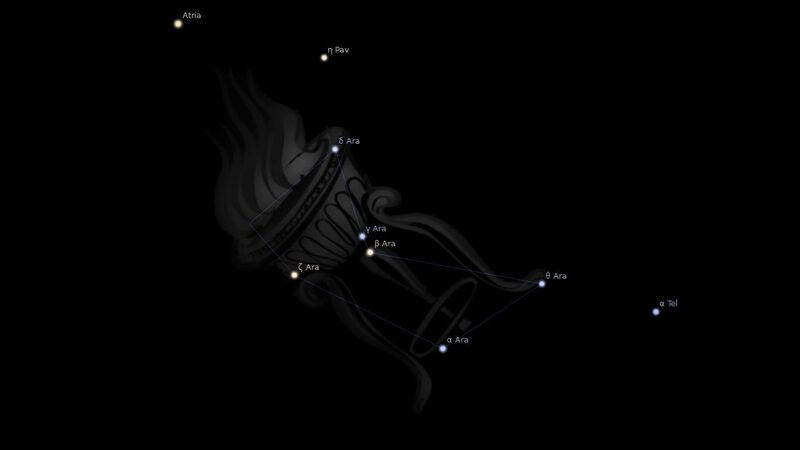 Ara spans 8 degrees of the Zodiac in the Sign of Sagittarius, and and contains 2 named stars. Durung the war between the Gods and Titans, the Gods leagued themselves together and swore to withstand their enemies, confirming their oath upon an altar built for the by the Cyclops. After their victory the altar was taken up to the heaven to commemorate the good resulting from unity. Ara represents the heavenly altar created by the gods of Mount Olympus to celebrate the defeat of the titans where the gods swore their allegiance to the supreme god Zeus/Jupiter. The smoke from the latar was said to pour out to create the Milky Way. According to another account Ara was the altar on which the Centaur Chiron (Centaurus) offered his sacrifices. Ara was also known as the altar that Noah built after the great flood. Ara lies in a dense part ogf the Milky Way south of the tail of the Scorpion. It is usually shown as an altar on which incense is burnt and occasionally shown as a pyre placed on the summit of a temple or a tower, or serving as a lighthouse. According to Ptolemy its influence is similar to that of Venus and also Mercury in some degree. it is said to give aptness in science, egoism, devotion and a love of ecclesiastical matters . Ara, the Altar… in classical times was intimately associated with Centaurus and Lupus, which it joined on the west before Norma was formed. It also was Altare, Apta Altaria, Altarium; Sacrarium and Sacris; Acerra, the small altar on which perfumes were burned before the dead; Batillus, an Incense Pan; Prunarum Conceptaculum, a Brazier; Focus, Lar, and Ignitabulum, all meaning a Hearth; and Estia (Hestia), or Vesta, the goddess of the hearth. The Alfonsine Tables added to some of these titles Puteus, a Pit; Sacrarius, and Templum, a Sacred Place; but represented it as a typical altar. The Leyden Manuscript made it a tripod censer with incense burning; the illustrated editions of Hyginus of 1488 and 1535, an altar from which flames ascend, with demons on either side; and an illustrated German manuscript of the 15th century showed the Pit with big demons thrusting little ones into the abyss. Here we have an altar or burning pyre, placed significantly and ominously upside down! with its fires burning and pointing downwards towards the lower regions, called Tartarus, or the abyss, or “outer-darkness.” It is an asterism with nine stars, of which three are of the 3rd magnitude, four of the 4th, etc. It is south of the Scorpion’s tail, and when these constellations were first formed it was visible only on the very lowest horizon of the south, pointing to the completion of all judgment in the lake of fire. 1. Fixed Stars and Constellations in Astrology, Vivian E. Robson, 1923,. 3. Star Names: Their Lore and Meaning, Richard H. Allen, 1889, p.61-64. 3. The Witness of the Stars, E. W. Bullinger, 14. Ara (the Altar).